If you still think Twitter is nothing more than a meme playground, you’ve fallen behind on the times. What is Twitter? It’s a multi-dimensional platform that serves as a respected news source, a newsfeed for statements from political officials and celebrities, and a community of shared sorrows and celebrations, to name few of its popular uses. Throughout my time in journalism school, remaining active on Twitter was required, and was often factored into our course grade. Twitter provides a “verified” check mark to validate profiles of celebrities, politicians, journalists, authors, and anyone else whose persona is oft-impersonated. This has helped Twitter further establish itself as an authoritative voice and an authenticated platform. Twitter is a social media and digital news platform that consists of profiles and a newsfeed. Users are able to “tweet” or post what they want to say, assuming they can fit it all into 280 characters or less. (Tweets were previously limited to 140 characters or less. Twitter slowly rolled out the 280 limit first with a small portion of users, and then to all in late 2017.) Users can also tweet photographs, videos, or GIFs, either with or without text attached. At its core, Twitter is yet another method of communication. Much like we share our engagements on Facebook and our vacations on Instagram, we share our thoughts on Twitter. They can be funny, or they can be poignant. There is no limit to the range of emotions that can be expressed in a tweet. If you’re needing a more in-depth look at what Twitter is and how to sign up, check out this guide to getting started that we’ve created just for beginners. Whether you’ve been tweeting for years, or have your mouse hovering over the “Create an account” option, this article has a little something for everyone. We’re going to briefly discuss the basics of what this platform offers society, and then delve further into the various ways it can affect and improve business. We’ll discuss tools that help make the most of Twitter, the platform’s marketing potential, and how to measure your success. Like other social media platforms, Twitter is a great place for your business to advertise. With so many users (more than 336 million monthly, to be exact) scrolling their newsfeeds on a daily basis, it just makes sense for organizations to have an active presence. Wondering how to optimize your Twitter presence for effective marketing results? You may be surprised to learn you’re not alone. Many are turning to twitter marketing to help expand their following and increase revenue. But how does it all work? Let’s break down some specifics. Let's talk more about how Twitter can be used as a marketing tool. As you would with any marketing campaign, a Twitter marketing campaign begins with determining your goals and being able to communicate them. 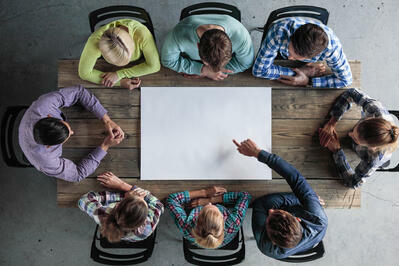 Why should your team be on Twitter? What's the best time to post on Twitter? What goals are you trying to accomplish by advertising or otherwise engaging on this platform? In order to determine your own goals, it may help to do some research on your competitors’ campaigns, their Twitter marketing success, or campaigns run by other brands on Twitter. Twitter will sometimes share case studies or other results of brand marketing campaigns as it boosts interest in their platform. Researching this information can help you become aware of the ways Twitter marketing can impact your bottom line. Having a personal understanding of its impact will make your efforts that much more successful. Make sure the goals you create are measurable. At the end of a quarter or half, you’ll want to be able to quantitatively prove to your boss that this campaign and platform were effective. They should also be reasonable. You’re not Nike, (unless you are, which would be pretty cool. Hello, Nike!) so you probably won’t be able to accumulate millions of followers within the next fiscal year. While you’re encouraged to challenge yourself, your goals should still be to scale with current scope and abilities. This is where an analysis of competitor data can come in handy - it may help you identify better, more realistic goals that are still actionable. No time to waste! Once you’ve developed your goals, it’s time to jump into action, mainly with a highly developed Twitter presence. Here are some steps you can take to optimize your profile and have a more effective impact. Twitter profiles are small but mighty blurbs at the top of your page that give audiences a 3-second insight into who you are as a person or organization. It should include a link to your website’s home page or whichever landing page is most important to draw the eyes of users. One professional draw of Twitter is how up close and personal it places you with your consumers or audience members. You have the ability to interact on a personal level with people who could become loyal customers, or network with like-minded business owners. A few ways to utilize your Twitter profile to its full potential are to continually reach out to others. Jump into conversations or Twitter threads you find interesting and relevant. Don’t be afraid to ask people to follow you back or retweet your content; especially if the content is relevant to their followers’ interests. Like others’ tweets, as the simple act of receiving a notification could lead people to check out your profile, peruse your product, or follow you back. Additionally, use Twitter to engage with influencers in the event that you might partner later on. If you’re unclear on what it means to partner with an influencer marketing professional, read our comprehensive guide covering everything on Influencer Marketing. People don’t pay much attention to profiles with no followers. It’s true what they say - high school never ends, and people will continue to judge you/your organization based on popularity. One effective aspect of marketing on Twitter is building up your network and accruing a decent following. Start out with the people you know. Your friends, your employees, your family. Ask these people to follow the profile, retweet content, and even invite their own networks to follow if they want. You should be tweeting regularly. In the same way it is off-putting to see a profile with no followers, it is also off-putting to see a profile with no tweets. Users want to know you’re active and have a present marketing or customer support team. While you don’t have to tweet at the same time every day, you should be tweeting every day. There should be a consistent strategy in place that engages users at peak hours. This keeps your business relevant by showing up in your followers’ feeds on a regular basis. TIP: Social media management software can help you maintain a social schedule across all of your social networks, not just Twitter. Marketing efforts mean nothing if you have no strategy in place for monitoring progress. Lucky for you, there are all kinds of ways to figure out not only how your content is doing, but also who is taking notice of your brand on social media platforms. Social media monitoring software tools play a big part in any fleshed-out Twitter marketing strategy. They show you how many users are engaging with your posts, and allow you to track and gather relevant content across wide ranges of social media. 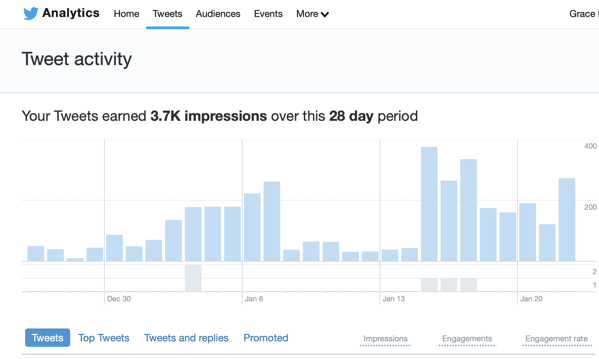 Twitter Analytics is a free built-in tool that comes with every Twitter account. It wouldn't be a bad idea to check out your analytics every once in a while. These products are intended to provide demographic data, understand social media presence, identify negative mentions, engage users, and improve a brand’s reputation, according to their definition on G2. Mentions are essentially any time someone mentions your brand’s name on social media. For example, consider a user is dissatisfied with your product. They don’t tweet at you (meaning they don’t tag you in the tweet), but they do include your brand name. Social media monitoring tools can help make you aware of these informal complaints so you have the opportunity to respond. If you’re advertising on any social media platform, you need to have a reporting strategy in place. Without it, you’ll surely miss out on certain metrics or mentions. TIP: Learn why marketers need Twitter data to stay competitive in 2019. Twitter is aware of its clout and ability to connect people around the world to the same topic. Hence, the creation of the hashtag. Hashtags are the “#” sign you see in front of words or phrases that serve to summarize what the tweet is about. Granted, some hashtags go completely out of control and span the length of a complete sentence. Hashtags are a sort of organizational strategy. They help users say, “these are my interests, this is what I’m talking about.” As a business, you should take advantage of using and viewing hashtags. Say you’re trying to advertise your orange grove. You’ll want to see what hashtags are associated with your industry. Related tags could be anything regarding the town in which you reside, to words or phrases that relate to your business. It’s not a perfect science — there is no one monitoring hashtag usage, so anyone can put anything on any post. This leaves a lot of posts with unrelated hashtags. But if you’re stumped on where to look to grow your network from the ground up, hashtags are a great place to start. Promoting tweets may also be of help to you. Much like boosting a Facebook marketing post, promoting a tweet means paying for it to show up more prominently in people’s newsfeeds. The idea is to increase engagement, awareness and interest. Promoted tweets are clearly labeled, as the internet has become stricter about sneakily posting ads. It’s imperative that your Twitter marketing strategy integrate or be consistent with your marketing efforts on other platforms or within alternate solutions. For example, if you have an email marketing newsletter, include links to your social media pages as part of your email signature. It doesn’t have to be an eyesore either; hyper-linking your profile pages into small Twitter, Instagram or Facebook logos gets the point across easily. Another way to integrate these platforms is to use one to raise awareness of the other. Are you looking for consumers to fill out an email survey? Tweet about the various ways they can sign up for your newsletter. This is especially effective if the survey has a sort of prize or incentive attached. Use that to intrigue followers and then attract them to your mailing list. Twitter is as much for users as it is for you to learn better business practices. Even if you don’t directly follow your competitors, at least keep an eye on what they’re posting to determine whether it’s achieving significant results. Want to go bigger? Instead of keeping track of the brands you compete with, keep track of the brands you’d like to compete with. Taking tips from brands with much larger budgets and teams will inspire you to go beyond your present circumstances and instead dream of all that could be possible. Twitter allows users to create lists. Lists are another organizational tool, kind of like how hashtags briefly denote what a tweet is about. Lists are like a group message, but for tweets. You, as the Twitter user, create lists based on what you are interested in. Say that’s horses. You want to have a separate feed that only consists on tweets about horses. So you find the top 20 Twitter users whose content you want to see on this horse list, and add them to it. Now when you want to know what’s going on in the horse world, all you have to do is navigate over to that list and view all 20 users’ updates. Twenty is a sample number, but lists can feature up to 5,000 users. Are there 5,000 horse influencers in existence? It beats me. Lists can be public or private, depending on who you’d like to see that list, and who you’d like to see that you created the list. For example, I wanted to create a list of guys that are obsessed with creating tubes. So I went to Elon Musk’s profile, clicked on the vertical ellipsis at the top right of the page, and clicked on “add or remove from lists.” Because I had not yet created the list, I did it right then and chose to add Elon Musk to it. Lists are good for your business because they allow you to sort competing brands, from consumers, from influencers, from friends and family, etc. Because Twitter news feeds essentially randomize posts, viewing your network through differentiated lists is a good way to make sure you don’t miss anything. Twitter advertisements are in the realm of Twitter marketing, although they’re not always the same thing. Twitter marketing is simply the act of using Twitter as a marketing tool to increase awareness and accomplish other brand-related goals. There are a couple of different ways you can directly advertise on Twitter. Before doing anything, you should determine how much you have to spend on this campaign. You want to get more than you give, and going in with a fuzzy idea of budget will derail the campaign from the beginning. When you create a Twitter campaign, it will ask you to enter your budget through a required daily maximum, and an optional overall budget. Both of these parameters help Twitter understand what you’re willing to spend so that it never goes over that amount. We’ll discuss exact costs in a bit, but for now, let’s go over the various reasons and ways to directly advertise on Twitter. New Follower Campaigns — Not all campaigns are directly in pursuit of profit. Yes, perhaps the results of a certain campaign could eventually lead to profit in a sort of butterfly-effect way, but that doesn’t mean it’s their main measure of success. Take, for example, the idea of a new follower campaign. This consists of organizations paying for promoted tweets, as well as to become a promoted follower, in the feeds of those who might be interested. New follower campaigns seek to raise awareness about a brand or product by increasing its, well, followers. Twitter makes it quite simple to begin one of these campaigns. To start, go to the Twitter Ads page, which exists specifically for businesses. From here, you can choose either to promote certain tweets, or launch a Twitter ad campaign. You’ll need to be able to answer several questions about the campaign, as well as about your followers. You are required to determine a campaign objective and a name. If you’re going for a new-follower campaign, “followers” are your objective. Twitter then requires you include the dates on your campaign, or how long it will run. Setting the audience of your campaign is perhaps the most important part. This determines who the promotions show up to. You can narrow down your audience through a number of ways, such as gender identity, a follower’s language, location, and the devices, platforms and carriers these promotions should appear on. You can also go on to target users according to the interests or preferences of which they have already informed Twitter. For example, if someone has indicated they are interested in sports, they may be a better target for your athletic deodorant stick than someone whose only noted interest is movies and books. (Not that moviegoers and readers don’t need deodorant — we all need deodorant — but targeting ads according to interest creates a more intentional campaign.) Many of the best Twitter Ad examples manage to target users based on their demographics. After you’ve communicated your intended audience to Twitter, it’s time to actually begin tweeting. Remember: the goal is to get people to follow you back, so try not to make these initial messages too flashy or media-heavy. They should have a simple call-to-action which, in this case, is to follow you back. You will want to create a couple of different versions of the tweet, all with the same objective. This way, certain followers aren’t seeing the same promotion several times. After the campaign has begun, be sure to look at your results. Twitter will track performance, so it’s your job to keep a record of what worked and why. Traffic and Conversion Campaigns — While it’s nice to gain new followers, you’re likely on Twitter because you want to convert casual observers into loyal consumers of either your product or your content. This can be done with a website clicks or conversion campaign, which leads viewers directly to your website. The difference? The follower campaign takes users to your profile, while the traffic and conversion campaign gets users off of Twitter and onto your business website. It can also track email subscriptions generated from the campaign, as well as product orders and page views. Conversion tracking can also be set up here. As the administrator, you begin by finding “conversion tracking” in the “tools” section of Twitter Ads. You have to inform Twitter of which types of conversions you’d like to track. Examples are visits to your homepage, product purchases, content downloads, an email subscription, or more. With the conversion tracking page, you have to develop a Universal Website Tag code that informs Twitter of what your website is. According to Twitter, the website tag can be generated in two ways: -universal website tag: a single code snippet that can be placed across your entire website in order to track multiple site actions or conversions-single-event website tag: a unique code snippet that can be used to track a single website conversion on your websiteFor more instructions on how exactly to deploy a conversion tracking campaign, thoroughly read through the “setup” tab on the conversion tracking for websites page on Twitter. Lead Generation and Capture Campaigns — We’ve discussed getting new followers and tracking conversions, but what is to be done about generating and capturing leads? Twitter has you covered with its option to run a Leads on Twitter campaign. This type of campaign allows followers and users to directly sign-up or otherwise opt-in to your offering right from a tweet. This is doable because Twitter already has their contact information stored within the platform. If your lead generation calls people to subscribe to a newsletter, their information can be entered automatically, should they opt-in. Again, this type of campaign is created through Twitter Ads and is referred to as a Leads on Twitter campaign. Twitter uses a “lead generation card” to allow for one-click submission. You create this card within the campaign after choosing many of the same features you chose for the new follower campaign. The lead generation card is what gets tweeted, and what people see on their end. Again, it should be engaging and have a clear call-to-action. With this type of campaign, it is okay to use images or video to draw attention, as you’re hoping to create a compelling enough campaign to turn people into subscribers.Once people opt-in to your campaign, Twitter collects them for you to download. If you are already utilizing a customer relationship management tool (CRM), you can import contacts through that. If not, you will have to export contacts manually. As a marketer, I’m sure you understand the importance of sticking to a budget, no matter how large or small. If you want to break into the Twitter market, perhaps it would help to understand the cost of advertising on this platform. It should be noted that creating a profile is free. Whether personal or professional, getting on Twitter, thus far, has no financial cost. It’s the decision to break into their advertising features that requires reaching into your pocketbook. Administrators looking to advertise on Twitter are charged for something called “billable actions.” A billable action is essentially, whatever the advertiser has opted into utilizing Twitter for. You’re only charged when successful. For example, when you choose the website clicks and conversions as your billable action, you will only be charged when someone clicks a link to your website. A link click is the billable action of the Website clicks and conversions campaign objective. In addition, Twitter ads do not charge you a fixed rate. Advertisers have to bid on available ad space in a sort of tweet auction. As with any market, supply and demand will determine final price. Administrators set their budget for a campaign at the outset, so they never exceed what they’ve already determined is maximum price. Now, I’ll walk you through the costs of running various advertising strategies on this platform. Campaigns - Twitter Ads are an intentional strategy where you use Twitter as an advertising platform. While some brands use Twitter as a social media platform to engage with followers, ad campaigns make your profile a splace for an amplified business message and increased engagements. Some perks of Twitter Ads, according to the business solutions for Twitter page, are the ability to expand your influence, connect with new audiences, and have control over how much you spend. There is no one set price of Twitter Ads. 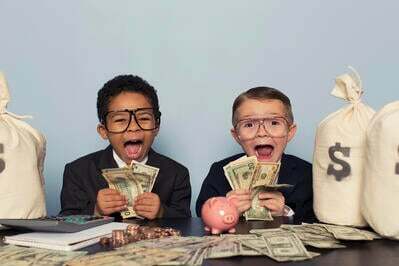 Administrators and business professionals set their own budget according to what they know they can spend. There is no minimum requirement, so you can set it to as low as $30 a day just to gauge initial success and/or impact. If you know you’d like to spend more than $1,000 per quarter (this is for the big-spending brands who consider Twitter a main component of their advertising strategy), you can request an IO (insertion order) from Twitter to help increase your credit limit. Promotions are another option for advertising on Twitter. With promoted tweets, you pay when a user performs a billable action. A billable action is favoriting, retweeting, clicking or replying to that promoted tweet. The objective of this strategy is to increase engagements with your content. According to ThriveHive, a promoted tweet costs $1.35 per engagement. Another option is to have your entire account promoted, which is referred to as a promoted account. The objective of this strategy is to gain new followers. Twitter turns all of your tweets into opportunities for brand engagement. You tweet as you normally do, and Twitter sifts through to see which tweets should be part of the promoted campaign. Promote mode is always on, and costs a monthly subscription fee of $99. Twitter claims promoted mode can help you reach up to 30,000 additional people and an average of 30 new followers per month. Promoted trends is another type of promotion, and a costly one at that. Promoted trends puts you at the forefront of other trending topics on Twitter. Also according to ThriveHive, paying to be part of the trending section can cost you up to $200,000 per day. At that price, it’s obvious the promoted trends strategy is not targeted toward smaller or even mid-sized businesses. They’re intended for large enterprises or celebrities who have a significant budget allocated toward advertising a specific product, concert, or event. Promoted trends display at the top of users’ Twitter homepage, meaning they get a lot of traction, clicks and impressions. Many users check their trending section regularly, as it often has news updates and other information on what’s going on in the world. By promoting your product or event in that space, Twitter is increasing the likelihood of engagement. Above are the trends currently displaying for my personal Twitter. As you can see, the first one is a promoted tweet. Being that promoted trends cost what they do, they are not something you should jump into without consideration. Utilize Twitter’s analytics tool to see what has performed well on your page and what kinds of content your followers or other users enjoy. Don’t forget to check out your competitors and see if they are using promoted trends or other Twitter strategies. Twitter Ads for agencies - Not every agency is well-versed in the Twitter marketing world. If you are an agency looking for assistance on a Twitter Ads campaign, you can utilize their Twitter Ads for agencies solution. This solution can help you with a number of agency/client interactions and business. It offers content to help you pitch Twitter to your clients by providing convincing statistics on recent campaigns. It can help you develop strategies of your own with presentation decks and blog posts that outline what works. Twitter can also help you with overall campaign management by offering their own best practices, as well as a developed FAQ. The cost of Twitter Ads for agencies will depend mostly on what you need, and at what volume. There is no exact price outlined on their website. The best way to figure out how much this offering costs is by contacting them on their agency solutions page and asking directly how you can work together. Something new Twitter is rolling out are their own Twitter election labels meant to help those voting in United States elections. Twitter has put a symbol of the US Capitol Building on the profiles and tweets of those running for state governor, US Senate, or the US House of Representatives. 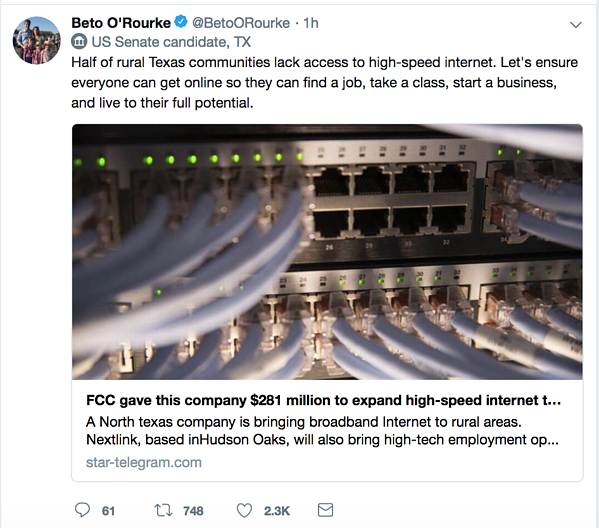 While this isn't a marketing strategy for businesses, it is a marketing strategy for politicians, as well as a strategy that could gain politicians new followers. This is obviously beneficial for politicians, as they're aiming to win a political election. These labels are also beneficial as they verify identity for those using Twitter to learn more about a politician's stance. These labels ensure tweets are coming from the real name on the account as opposed to an imposter who might be trying to hurt that politician's chances at winning. Twitter for Business is a subset of the social media platform that is specifically geared toward brands and brand promotion. If you haven’t utilized Twitter much before, and especially not as a brand or business, Twitter has a variety of tools to help you get started. 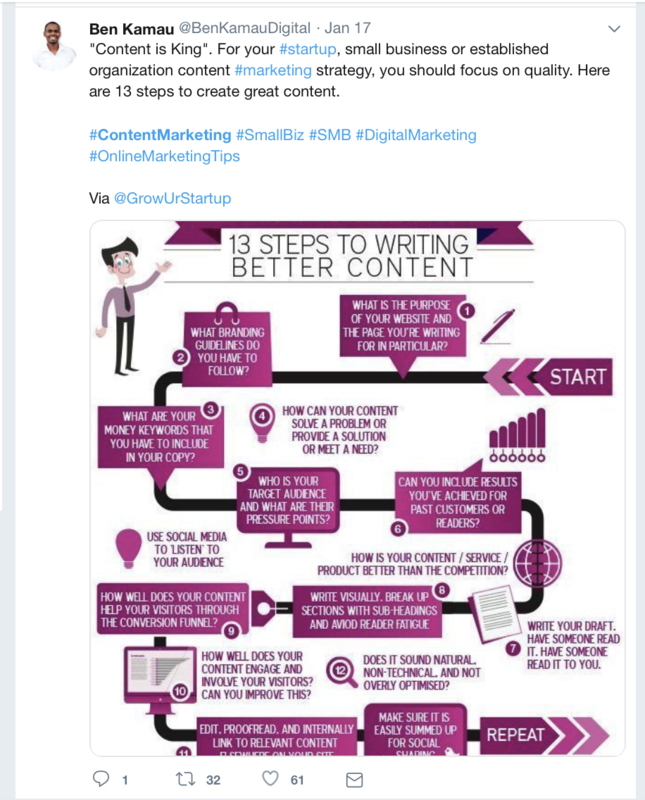 The Twitter for Business Basics page can help you with every aspect of getting started, such as creating a profile, deciding on what to tweet, accruing a decent following, and connecting with current or potential customers. They even have a tool that helps you craft better tweets by recommending new strategies. Some examples of quick tips Twitter provides users to creating better content is to keep copy short, use visuals and other digital media, and to engage the community with surveys and polls. They also encourage users to take advantage of the free analytics features that help determine which types of content are seeing success. Twitter is considered to be a microblogging tool, and one of the first, at that. Microblogging is sort of like bullet journaling, but for the internet. Twitter is a way to microblog for your customers’ consumption. You’re not able to provide the types of longform content you could on your actual website, blog, or even Facebook. But you are able to provide tiny updates that create intrigue and potentially increase consumership. The reason it’s important for your business to be on Twitter is because of how many other users are on it every day. In case you’ve already forgotten, it’s around 33 million active users. If you’re not appearing on this popular platform, that’s 33 million engagements you’ve decided you don’t want. You should be on Twitter to showcase your brand in a way that is interesting and relevant to consumers. Twitter is yet another space to communicate your beloved brand. It’s important that your Twitter brand strategy is aligned with your communications on other platforms. Let’s consider the various aspects of Twitter that provide an opportunity for branding. Username - Your username is also referred to as your handle, and it’s how users tag you, find your profile, and otherwise communicate. If we’re being honest, I typically don’t pay much attention to a person or brand’s username. I am more likely to look at their profile name, which is bolder and more obvious in my newsfeed. However, the fact remains that your username is an important branding moment. While individuals can make their handles quirky and fun, your business’s handle should be straight-forward and obvious. If I’m trying to find a celebrity, politician, brand, or other verified user, I want their username to be as simple as possible so I can find them quickly. You’ll notice that all of these usernames are almost identical to their brand names, minus symbols and spaces, which makes them easy to find and tag in tweets to the brand. Bio - Your brand bio should be a quick description of who you are and what the page is for. Some Twitter pages are specifically for customer service or technical issues, while others are all-encompassing profiles that are combined to cover everything. Consider this bio from Bed Bath and Beyond: Welcome to our page where you'll find tips & solutions for your home and beyond. Need help? Send us a message! Share your finds with #bedbathandbeyond. They’ve made it clear that this Twitter page offers content to help users, such as their July 4 tweet that recommended products to help people sleep well in warm weather. Their bio also establishes that this page is safe for customer support or other types of questions. There’s a quick call to action at the end that encourages users to share their finds. Brands are wise to ask followers and users to share their purchases, as it creates social media content for the social media manager, as well as acts as an additional advertisement for the company. The bio should follow brand guidelines and communicate with language similar to your other profiles and advertisements. If your tone is not sarcastic or witty on other profiles, it would be strange to take up that style on this new platform. To users, it may feel like the account is disingenuine or illegitimate. The bio also should list the location of your business (if you only have one) and have a link to a landing page you want visitors to click. The landing page can be your homepage, or it could be a link to a competition you’re hosting, or to a big blowout sale. Images - Twitter profiles have two images: the profile picture, and the cover photo. The profile photo is, more often than not, a smaller version of the brand logo or brand name. It should be easily recognizable, and likely it will not change very much. If it does change, users should still be able to associate the image with your brand. This is the image Six Flags uses for their Twitter profile, which is the same as the brand image they use on Facebook and Instagram. Not only is the picture their iconic logo, but it’s also consistent across multiple platforms. If a user is looking for Six Flags, they know the profile will feature this image. Tweets - The actual tweets you produce are a branding decision that should not be taken lightly. This is where tone and message really come into play. Take, for example, the film and TV streaming service, Netflix. They tweet with a casual, sometimes sarcastic tone, and even “drag” users for watching the same content too many times in a row. Their service revolves around popular culture, meaning their tone should comply. They know they’re tweeting to younger generations, as well as generations that keep up-to-date with digital media. Tone continuity and its impact via your tweets is important because you have an audience on the other side. If you’re a fairly serious law firm whose dealings are mostly divorce and estate separation, your tweets probably shouldn’t be sarcastic. Your network is expecting that you take matters seriously and can handle heavy subject matter professionally. Before you begin tweeting as a brand, develop a set of brand guidelines that you and your social media team can follow. These guidelines will ensure that no matter who is tweeting, the responses are consistent according to the predetermined regulations. The tone will change depending on what kind of Twitter profile you’re running. Some brands have a separate Twitter for customer service (more on that below) and technical support, while other brands operate completely out of one profile. The type of profile will determine the brand guidelines, so make sure you’ve fleshed those out with the profile’s purpose in mind. Customer Service - Brand customer service has become a huge part of Twitter. As we previously discussed, some brands have a separate profile just to deal with customer issues that may arise. If you use Slack at work, you may understand the panic that ensues when the platform shuts down during a workday. 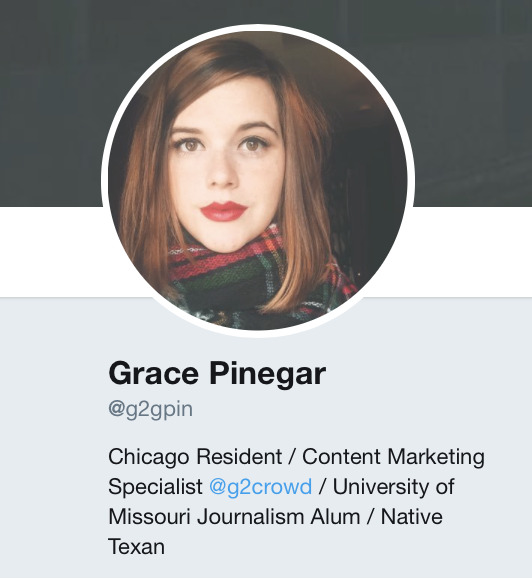 In fact, our office at G2 Crowd Chicago is split between two separate floors, not being able to use Slack means instead using our workday to track people down on different floors just to ask quick questions. But can you imagine how Slack felt when their platform shut down for offices all around the country? Professionals all over were refreshing their Slack apps, wondering if it was just them, or the entire tool. Slack took to their customer service Twitter, @SlackStatus, to keep users informed on how the platform was doing. In today’s digital age, it’s not always a user’s first instinct to get on the phone with a customer support agent. Customer service Twitter profiles help users stay updated at all times. If you have a customer service Twitter profile, you’ll want to develop brand guidelines not only on how you generally tweet, but also how you communicate with potentially disgruntled customers. We all know customer service is a rough environment wherein you are interacting with frustrated consumers. For this reason, it’s important for employees to have a standardized method of responding even to the most unpleasant of individuals. Whether you’ve considered it or not, the way you serve customers on Twitter is a reflection of your brand as a whole. Ads - The types of ads you produce are yet another opportunity to develop your brand on Twitter. Ads are promoted, meaning they are sometimes seen by people who aren’t even following you. In some cases, your ads are a person’s first impression of who your brand is. With this in mind, ensure your ads are interesting, engaging and informative. There are so many different ways to advertise, and our content at G2 Crowd can help you get started on your journeys with guerrilla marketing and affiliate marketing. When you advertise on Twitter, choose a strategy that works for you and stick with it. Network - Who you follow and who follows you is a sentiment reminiscent of your “clique” in high school, so to speak. It’s important for you as a brand to not follow anyone or anything that could jeopardize your reputation. For example, if you’re not running a politically affiliated profile, there’s no reason to follow certain candidates or profiles otherwise associated with the causes they support. This could be seen as a conflict of interest. Additionally, you probably don’t want to lose followers over liking or retweeting something that other users and followers find distasteful. Some brands like to take a stand, which is their choice. For example, after the school shooting in Parkland, Florida, many brands discontinued their partnership with the NRA. They made a potentially divisive decision that was in line with their overall brand convictions. Because a lot of consumers choose to primarily support brands that they align with morally, it’s possible those businesses and organizations lost customers that day. Regardless of the decisions you make in who or what to support, just be aware that these decisions can impact business. Twitter marketing is part of a community greater than itself. Marketing utilizes many platforms and, in order to see the value of Twitter marketing, it’s important to touch on other familiar forms. In order to better understand Twitter marketing, it may help to have a background on social media marketing as a whole. Consider G2’s very own Claire Brenner, who has written a comprehensive guide on the topic of social media marketing. Since there’s no need to completely restate her excellent points, let’s just take from what she’s said. In order to get a handle (no pun intended) on why Twitter is a vital aspect of your comprehensive social media strategy, you should be well-versed in the potential for other platforms. All types of social media marketing are online, but not all types of online marketing are on social media. Simply put, online marketing is any type of marketing done over the internet, where the potential customer views or experiences targeted messaging on an online platform. There are no other solid parameters on what it has to be. Online marketing includes paid traffic, as well as organic methods such as search engine optimization (SEO). Keyword targeting is another way to increase traffic. Businesses pay for the attention they achieve through ads published with certain keywords. Another term for this is search engine marketing (SEM). SEO software is a marketers best line of attack for handling their SEO-related efforts. And then, of course, you have content marketing, which my colleagues and I attempt to execute successfully. Content marketing is the dissemination of blogs, byline articles, infographics, and other media by knowledgeable employees that might attract reader interest. Social media marketing is an asset to online marketers. Social media content often drives followers’ attention to content on other platforms. An Instagram post can lead targeted individuals directly to your website, or a tweet could call users to sign up for your email marketing list. No matter which option you choose, the end result is the same. You’re hoping to drive traffic to your website and improve organic search rankings through the content and advertisements produced. I know what you’re thinking by now; all of these labels sound exactly the same. Stick with me. There are still a couple types of marketing to discuss, and I promise we’re going to clear them all up. When you think of mobile marketing, think of trying to catch users who are on the go. Mobile marketing is a multi-channel digital strategy geared toward catching audiences who are on their tablets, smartphones, and other mobile devices. Mobile marketing reaches out to potential customers through text messaging, email, social media platforms, and other apps. A goal of mobile marketing is to execute content that can grab attention on any device or platform. One overlooked example of mobile marketing is creating a website or blog that is optimized for viewing from a cell phone. If you advertise to someone who is using Twitter on their phone, but then your mobile site is difficult to navigate, you’ve lost that follower’s interest and money. A few things to remember about mobile marketing are that you’re meeting consumers where they're at, and content should be both compelling and relevant. If your consumer base is mostly teens, you may want to consider sending notifications directly to their cell phones (push notifications) so instead of using email marketing. Facebook is more than a social media platform. Over the years, it has become a major advertising platform as well. And a big one at that, with more than 1.32 billion active users. Facebook Ads are a vital aspect of any comprehensive marketing strategy. Thousands of businesses use Facebook Audience Insights to understand their audience and make meaningful connections on the platform. In the same way, some organizations have a standalone Twitter marketing strategy, many also have a standalone Facebook marketing strategy. If you want a more comprehensive look at what this kind of strategy entails, check out Claire Brenner’s Facebook Marketing strategy guide. She offers even more detail on the ad strategy itself. If you’re a business owner, the phrase “market trends” should be a huge buzzword to you. Regular research on market trends helps you determine present and possibly future patterns in consumer spending. Digital marketing trends are equally as important to understand. Digital marketing trends are basically the fluctuation of growth regarding various platforms or topics. Being that digital marketing can accrue leads and increase revenue, it’s important to be aware of which platforms and advancements are performing well. At the beginning of 2018, Digital Marketing Institute published some predictions on changes in digital marketing they thought would take place. Examples of their predictions were Twitter falling while LinkedIn rises, and the idea that brands might more heavily invest in influencer marketing strategies. We’ve talked about promoted tweets and trends on Twitter, so let’s briefly discuss the specifics of sponsored advertisements on other social media platforms. Facebook sponsored ads have been said to drive almost 25 percent of all social referral traffic, according to a study by Marketing Land. Facebook has a heap load of information about your consumers, including what they like, and what they like to click on. While tougher security measures are rightfully being taken to ensure user data remains private, this platform is still great for targeted advertising. Facebook sponsored ads can show up on mobile devices, within newsfeeds, or on a user’s sidebar. These sponsored ads have their own specific landing pages so administrators can clearly assess an ad’s click and conversion rates. You can choose the makeup of your ad as well. Facebook provides the options of a video, link or carousel ad. Sources say best practice is to utilize the single photo or link ad, as they resemble unpaid posts. Instagram marketing sponsored ads, considering that Instagram is mostly a photo and video platform, are always photo or video ads. Carousel ads allow users to flip through additional photos that are compiled into one advertisement. Ads on Instagram can also be delivered through stories. Instagram Stories are the increasingly popular “banners” so to speak that live on your profile for a day’s time. As users scan through their friends’ stories, commercial advertisements pop up to engage users. Instagram ads are said to help with many of the same features other platforms help with: increased brand awareness, conversion, and increased traffic or website clicks. On Instagram, you can buy and run ads internally through the app, through the ads manager, or with Instagram partners. Similar to Twitter Ads for Agencies, this service helps those who need it best execute their ad strategies. In order to have an Instagram Business profile, or a professional profile for your product or organization, you must also have a Facebook business page. Instagram and Facebook profiles display much of the same information, and integrating the two allows the platforms to share information you’ve already uploaded. A critical part of running a campaign on social media, or using social media as a marketing tool, is understanding the ins and outs of managing social media accounts in general. Let’s talk through some of the basics. Having a professional social media profile just means you’re opening up your business to communication in a new way. Whereas you may already have existing email marketing or have learned how to create a newsletter, you now have profiles, newsfeeds, and inboxes that can handle direct mail. Use Analytics: Whether it’s Google Analytics, Twitter Analytics, Facebook Analytics, or whatever other profiles you’re utilizing, campaigns should be data-driven. Analytics features help you determine what content users are engaging with, and what content is falling flat. If you’re not using analytics to help create a successful social media strategy, you may as well have someone hand you a $20 bill and then throw it away. The analogy here is that you’re trashing free money. Lots of analytics are free or part of your business membership/subscription, and making use of that data could have a serious impact on all you’re able to accomplish. Know Your Audience: As a business person or business owner, you already know the importance of understanding the consumer. But it’s additionally important to know who your consumer is on social media, and whether they’re the same.One way to get to know your social audience is to perform market trend research based on their demographic data. What do people their age like to see? What do people in their location like to see? Quality AND Quantity: When it comes to social media, it matters to know both what and when to post. As for quality, make sure your images are clear, videos are engaging, and the copy is unique. Correct spelling and grammar is big in social media marketing, as language enthusiasts are always at the ready to correct typos and other errors - being called out in public by this can damage your brand’s credibility. Additionally, you don’t want to overwhelm your audience by posting too much in any given timeframe. There are certain times of day that are proven to get more attention, such as during your local rush hour to and/or from work. Alternately, posts made during sleeping hours (10 p.m. or later) may not receive as much attention. Do your research on when your audience is online, and you shouldn’t have an issue finding people when they are open to being found. Distinct Voice and Guidelines: Your social media profiles should be an extension of your brand. The voice should be distinct enough that it stands out from competitors, but consistent enough that it’s recognized across profiles. To help with this, you may consider drafting some brand guidelines. This helps various employees understand the boundaries around what they can post and how they should interact with consumers and followers. Some profiles have the specific employee responding to messages sign off with their own personal initials so as to encourage accountability across the board. Utilize Software Solutions: We’ll talk more about this below, but social media management software could save you a ton of time and effort. These solutions are capable of helping you schedule out posts and automating other tasks. Some social media management tools can also offer you the analytics we established earlier as important to the efficacy of your strategy. Social media management tools gauge the impact of hashtags and can develop reports on keywords and top influencers. Form Connections/Network: Lest we forget, an important part of social media is being social. As a brand or business owner, you have an obligation to engage with users, get to know them, and prove your interest in their lives. You could do this by hosting Twitter polls or letting users ask you questions as you answer them in a thread. Never consider your brand too good to engage with users. Networking is an overlooked aspect of social media profiles, in my opinion. But if you jump into a conversation and engage that users, you may just get yourself a new loyal user. We touched on this briefly, but social media management software have an endless array of positive implications for business. Among their many features, a few examples are social sharing, social engagement, social campaigns, and social analytics. The point is uncontested: social media management tools make the daily upkeep of your many social media profiles easier. Social media monitoring is another aspect of social media management. It is the act of listening to consumers and publishers to monitor what they’re saying across various channels such as social media and news publications. Have you ever wondered how a brand found your tweet, even though you didn’t directly tag them? It’s with social media monitoring features. These tools constantly scrape the internet and index websites, offering users updated information on who is saying what about certain topics. Perhaps surprisingly, these tools scrape more than just social media. They can scan the entire web, including forums, blogs, and review sites (such as ours!). The specific method of finding mentions depends on the tool you use. Some solutions have you write queries to determine exactly what you’re looking for, while others come up with more generic results. Because the solutions can only access public data, there’s no risk of compromising personal information. After the mentions have been tracked down, you get to decide what to do with the information. Some solutions can even provide a sentiment analysis that determines if the majority of mentions were positive or negative. Another word for this is “opinion mining,” and it can be used to determine anything from brand perception to public opinion of political candidates. Social media monitoring solutions increase your opportunities for customer interactions. Imagine there’s a negative tweet going around about a product of yours that disintegrated during a rough bout of cross-country shipping, but the consumer chose to tweet about it instead of contacting your customer service. If you’re not quite ready to commit to a social media monitoring solution, try out socialmention. It’s a real-time social media search and analysis platform. Users simply have to enter a subject, say where they’d like to search for it in, and press search. As I’m writing this on Amazon Prime Day — the same day Amazon webpages all over had some major glitches and shutdowns — that’s what I’ll run as a sample search. The first few articles regard Prime Day, with one detailing how European workers chose today to go on strike. We have some information about Jeff Bezos’ financial welfare, while almost everything else is an article about various deals. The page delivers a sort of report in the left sidebar that details sentiment, top keywords, percentage of passion, and percent of reach. This page only shows 1-15 of 44 total mentions. If a journalist or blogger wanted to do a quick piece on the overall public’s feelings on Prime Day, a tool such as this could help them gather information in one fell swoop. As you can see at the top of the page, Social Mention can scrape blogs, microblogs, bookmarks, images, videos, and more. Their advanced search preferences even allow you to search for results in other languages, making it accessible globally. Now that we’ve discussed social media as a whole, let’s get back to the specific beast at hand. Twitter profiles can either be managed independently or as a suite of social media platforms — it simply depends on your organization and the social media environments where you deem it important to partake. In order to successfully manage your Twitter profile, you may want to invest in a social media monitoring solution such as the kind we mentioned above. Twitter has a reputation of being not only a social platform but also a location ripe with customer service requests. Keeping an eye on your brand mentions could only help you continue to develop a positive online reputation. Scheduling — Helps schedule content to release and automate posts so as to remove mundane tasks from the social media manager’s list. Monitoring — Monitors conversations and search posts by keyword or location to keep you in the loop on what your customers are saying. Social Media Calendar — Used to organize your copy, photos, and types of content in one place to help manage your campaigns and hit set deadlines. Content Curation — Helps you develop and publish content either by refurbishing old posts, organizing your library, and ensuring content has to be approved prior to publication. 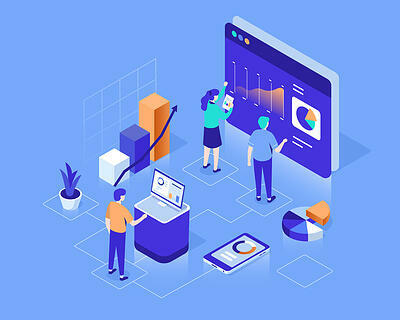 Analytics — Provides an overview of important trends and growth, as well as develop various reports on progress and engagement. Can keep track of your team’s performance and integrate with other analytic tools. Team Management — Restricts access to your social media accounts to specifically approved personnel, and apply unique permissions to each. Can act as a project management solution that delves out assignments to departments or team members. Security — Notifies you of any suspicious behavior or activity, such as a password change or a new device. Keeps unauthorized personnel from accessing your account. Ensures your profiles follow regulations. Boosting — Promotes content to social media platforms from directly within the social media monitoring app. Can reach out to new audiences and edit demographics from within the solution. Plans — Creates a plan that caters to your business size or other individual needs as opposed to offering one option to all organizations. Social Selling — Helps more enterprise organizations by providing a social selling solution for their sales teams. Ads — Offers an automated ad solution that improves the reach of organic advertisements. Educational Content — Provides courses that further educate users on topics such as content publishing and making the most of a dashboard. To really see the possibilities within a Twitter campaign, let’s look at one strategy utilized by renowned athletic brand, Adidas. In the case study by Twitter, Adidas took advantage of an upcoming athletic event and used it to engage followers. “Aware of the opportunity presented by the Madrid Marathon (‎@RNRmadmaraton), Adidas Spain (‎@adidas_ES) created a highly targeted and personalized solution around the hashtag ‎#WHYIRUNMADRID. ‎@adidas_ES knew that part of its audience were fans of such competitive events and that Twitter, with its real-time nature and its advanced targeting options, was a perfect way to reach them. The campaign was successful due to Adidas’s strategy. They engaged with users who were interested in a communal topic. Additionally, they sent out a call to action by including a voting card on the tweets. Also known as Twitter Brand resources, brand assets are the tools Twitter provides to make your brand look more legitimate and professional online. From links to download the logo icons to downloadable brand guidelines, this set of tools helps you really put your best foot forward on the platform. Twitter is a great way to connect with your peers, customers, and colleagues. At the end of the day, that’s why we log on to these sites - to experience human connection through a digital resource. So long as your brand caters to who your consumers are as people, with understanding and engaging content, your marketing strategy should take off.